Melodramas! Whodunnits! Aliens! Squirrels! All-singing, all-dancing pilgrims! 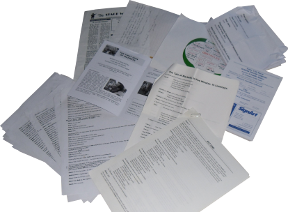 All this and more at the Pendon Writers' Circle, as six aspiring writers meet on an evening before Christmas. Mild-mannered chairman Arnold is a housebound carer for his bed-ridden mother. Retired teacher Brevis used to write musicals for the school where he once had power. Grace wants to write stories for her children who grew up a long time ago, and Jess struggles to put a single word to page for her historical romance. Vivvi's crime fiction endless overwrites about a perfect man she once knew, and Clem writes incomprehensible science fiction based on a conspiracy at the local town hall. And yet Ilsa, the weekly stand-in carer for Arnold's mother, idolises them all as famous authors. Arnold suggests they all collaborate on a piece, but the idea is a non-starter. Or is it? After the meeting, some very strange things start to happen. 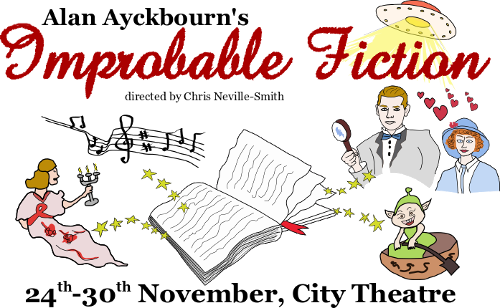 Improbable Fiction was premiered in 2005 at the Stephen Joseph Theatre and his since become one of Ayckbourn's most popular and most performed works. Part zany comedy, part touching portrayal of loneliness, join us for a writers' collaboration like you've never seen before. Improbable Fiction was performed on the 24th-30th November at the City Theatre for Durham Dramatic Society. This was my first full-length play I'd directed, and it turned out I'd vastly underestimated how complicated this play was. But I kept on top of things, and it looks like the feedback from this was rather good. Five of the nights either sold out or almost sold out, with a final figure of 90% sales achieved. I can't entirely take the credit for that - the biggest factor is who wrote the play, and that's entirely Mr. Ayckbourn's doing. However, there was a sharp pickup in ticket sales after the opening night, which is usually a good sign that you'ev done something right. This was also the début appearance for four of the seven members of cast. Welcome to DDS, may your stay be a long one. Oh, and it got voted best production of 2013 by DDS members. I don't read too much into this myself, but all the same, well done everyone for making this possible. All pictures © Wendy Smith, taken during the dress rehearsal on the 22nd October. These pictures are at an internet-friendly resolution - please contact Wendy Smith at DDS if you want print version or high-resolution digital versions. The old casting information is available in an archive if anyone still wants to see that. This includes some handy descriptions of the characters if anyone wants to use it for their own productions.